Two vegan food bloggers go out to dinner. 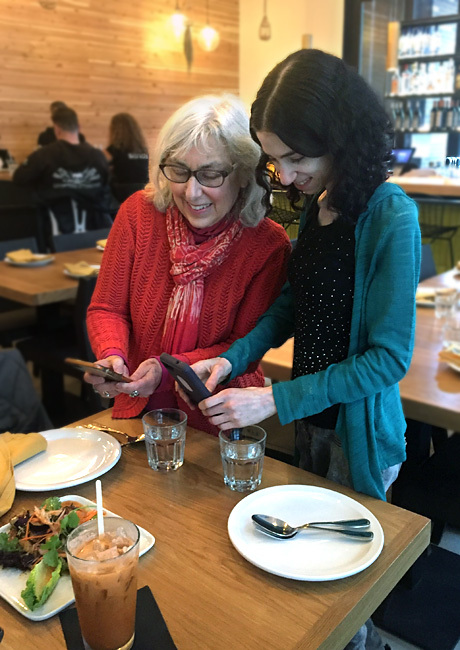 In my last post about Seattle Vegfest, I mentioned that my husband and I attended a cooking demo by cookbook author and blogger, Hannah Kaminsky, and we three later went out to dinner together. We've been blog friends for a long time, and it was wonderful getting to spend real-life time together. When we went to pick up Hannah from her air B&B, we were startled to find it located in the middle of the steepest, most alarmingly vertical city street we've ever seen in Seattle. It was so steep that my husband, who was driving, refused to drive down it, so we parked at the cross street at the top, and carefully walked down to meet her. I kind of wanted to drive down the slope just to see what it felt like, but I had to settle for walking. I imagine on snowy or icy days, people who live on the block don't bother to get out of bed. In nice weather, if you wanted some exercise, you could just walk up and down the street a couple of times and call it a day. Lovely house, though, and good views! 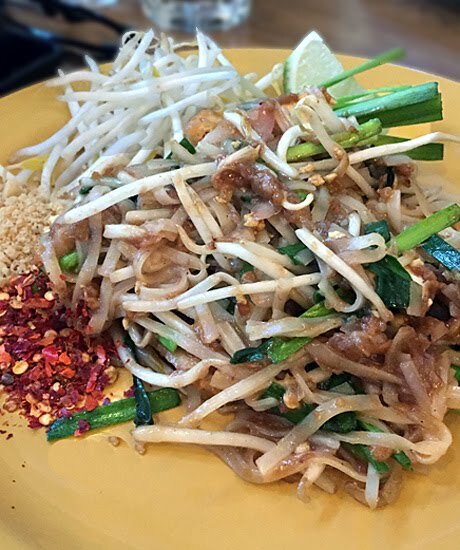 We had picked a restaurant relatively close by in South Lake Union called, Kati Vegan Thai. It's always a treat to go to a restaurant that's 100% vegan where you don't have to negotiate the vegan options. My husband and I had been there twice before and enjoyed it, and I already knew they had lots of gluten-free dishes. In addition to having good food, it's a pleasant, quiet place where it's possible to have a conversation as well as dinner. My friend Kati recently dined there, and said she was told by the owner that 'Kati', pronounced Kah tee in Thai, means coconut milk. 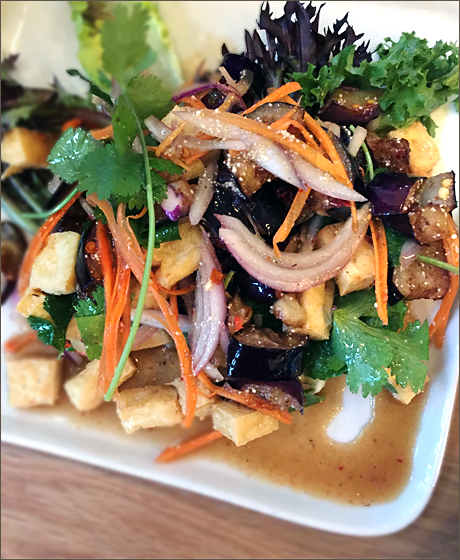 The food at Kati Vegan Thai isn't exotic, heavily sauced and intensely spiced — it's fresh , simple, delicious food. According to their Web site, "Making it ‘easy’ is keeping things simple, getting it right, and doing it fast. It’s about picking the best ingredients at the open air market every afternoon. It is trusting in technique over ‘secret sauces’. It’s about channeling natural flavor combinations instead of eclectic fusions and rare ingredients from afar. Says Fon, 'Perfect does not have to be complicated!' We believe in honesty and respect for ourselves and our customers. 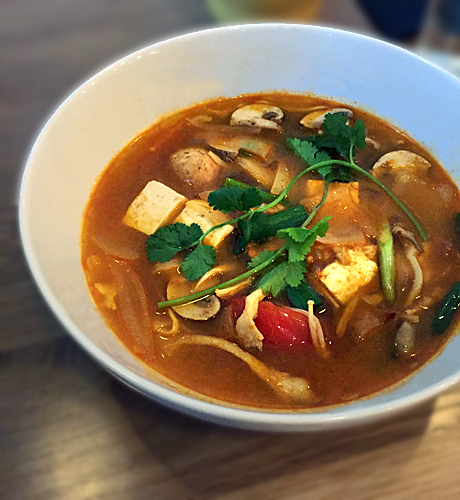 Kati specializes in healthful and flavorful cuisine made with plant-based ingredients. We choose fresh ingredients with only as much cooking oil as needed. We also want to live in a clean and sustainable world, and choose biodegradable products." tom yum, “the classic sour and spicy herbal soup;"
old-style pad Thai, "a uniquely delicious pad Thai found only at Kati;” and pad pak, “broccoli, cauliflower, napa cabbage, and carrots stir-fried in mild garlic sauce.” I forgot to take a photo of the pad pak, the last dish to arrive at the table. Guess I was too busy eating by the time it appeared. I enjoyed all four dishes! After dinner we began talking about vegan desserts, with an emphasis on ice cream, a subject dear to Hannah's heart. We decided to travel to the Greenwood neighborhood for scoops of ice cream at the Cookie Counter, an all-vegan ice cream parlor and bakery. The Cookie Counter started as a vegan ice cream truck, then crowd-funded into an adorable little shop where they make and sell delicious coconut milk-based ice cream. It was close to closing time when we arrived but there were still lots of people enjoying ice cream, and more people arriving. Ken got a scoop of chocolate in a waffle cone, I got a scoop of mint chip in a cake cone and Hannah got a scoop of mint chip with a chocolate shell in a waffle bowl. I didn't notice the waffle bowls or I would have gotten one, too! Next time. Once again I neglected my blogger duty to photograph all food I encounter, but Hannah saved the day by capturing an ice cream moment. In other news, if you have any interest in entering a vegan recipe contest, read the notice below. There are lots of good prizes! DENVER, CO - Kroger’s Live Naturally magazine, along with Kroger’s organic line Simple Truth, are partnering with celebrities and brands within the plant-based market to offer a recipe contest offering $1,000 as the grand prize. A call for recipe submissions began on April 3, 2018 and ends on July 15, 2018. World-renowned vegan chef and 2017 Vegetarian Hall of Fame Inductee Mark Reinfeld of Vegan Fusion and The Doctor & The Chef created the contest to encourage creativity and create awareness of plant-based cuisine. Celebrity judge Ellie Krieger will help choose the winners. Ellie is the host and executive producer of the new cooking series “Ellie’s Real Good Food” and is well-known from her hit Food Network show. For contest rules, a complete list of prizes and to submit your recipe, visit www.LiveNaturallyMagazine.com/RecipeContest/. Ah, such delicious memories... I had a really fun time with you both and am so grateful we could catch up! Your reccomendation for Kati Thai was spot-on. I loved my Thai iced tea, too, which I realized I should have shared. I'm so glad you liked the food! It's not a flashy place, but I appreciate the high quality of the ingredients and the skill with which they are prepared — and the taste! Of course everything tastes better with good company! The photos are okay for iphone shots — I've gotten a bit lazy. Thanks for letting me know about the link — should be fixed now. It was missing a /. Ah, that's right, I forgot you were using an iPhone- All the more impressive! Yay - how cool to be able to meet a blog pal and see them in real life for food. That's living the dream! 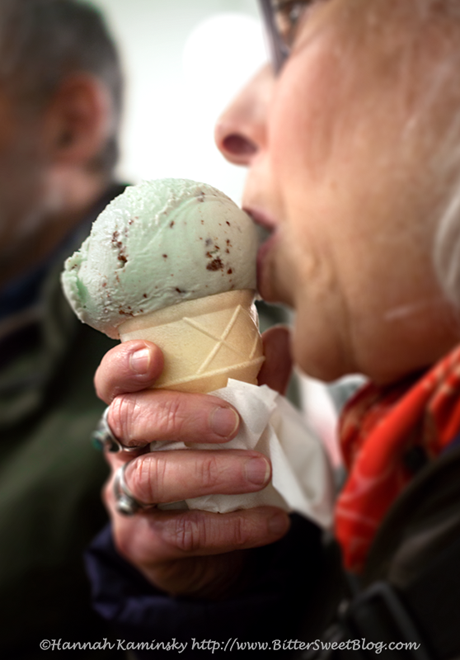 The ice cream in particular looks gorgeous - mint choc chip is one of my favourite flavours and not seen as often as it should be round these parts! It really was fun. And I LOVE the mint chip at Cookie Counter. It's just the way I like it, and not sickening sweet. I just wish I had noticed the waffle bowls. Thanks! The ice cream photo was taken by a photographer with a real camera (Hannah) but the rest with an iphone in the dim restaurant light.